For my personal card I have used the Life is Sweet Stamp Set. For the sentiment I used some Raven Hybrid ink and black embossing powder. 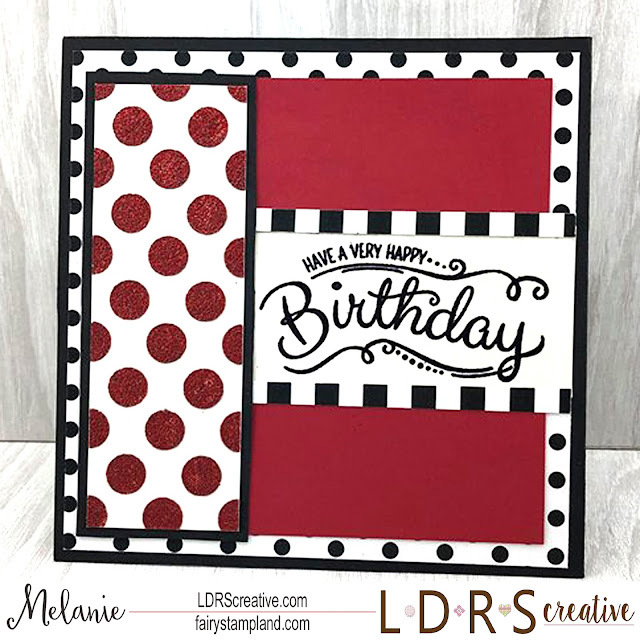 I have also used the really cool Playful Patterns Stencil along with some texture glitter paste for the red glittery paper. Make sure you also see the brand new papers HERE. 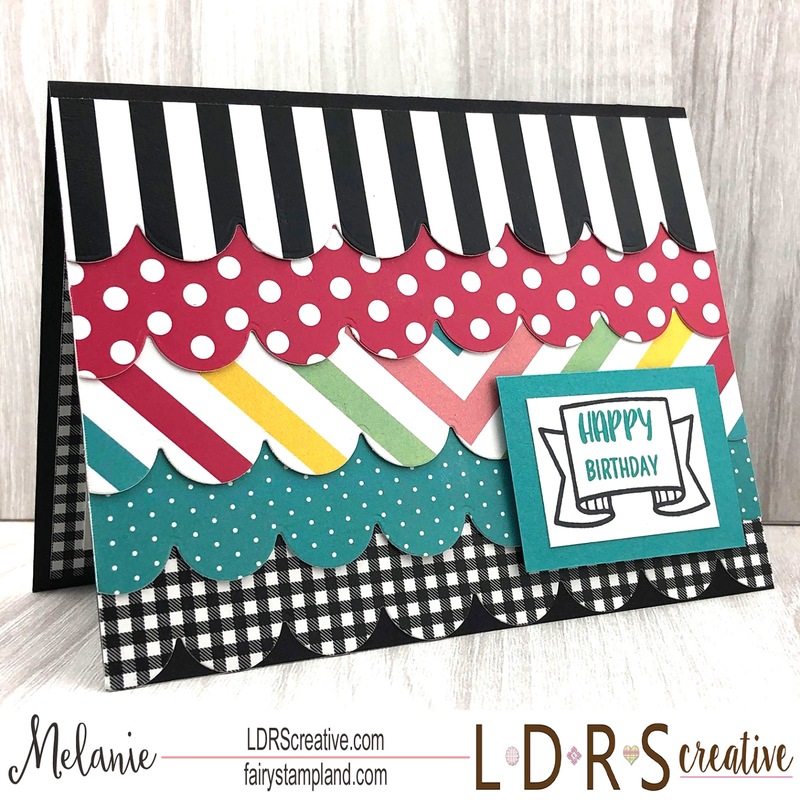 For my personal project I have created this card showing off the Sweet Sensations 6x6 paper stack . I used the Scalloped Border Die set as well. For the sentiment I have used the breand new "Party Time" stamp set. I even decorated the inside of the same stamp set. Isn't it cute? 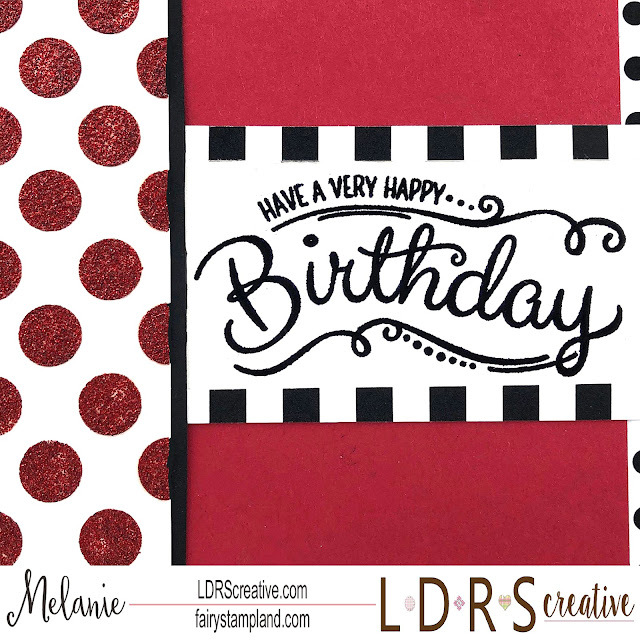 Today I am here sharing my newest card featuring LDRS Creative products. I really enjoyed an evening coloring while creating this stamped background. As you can see I was in a rainbow mood while creating this. The first thing I did was carefully stamp the background using two border stamps that are a part of the "Let Love Grow" stamp set. To make sure I got good even coverage of ink as well as getting the stamps close enough together I decided to use my Stamparatus. I stamped the first row of roses and then I removed that stamp and placed the heart stamp butted up close to the roses. By doing this time after time it allowed for an evenly spaced design. Let the coloring begin!!! I used Copic markers, a light and a dark from each color family. Super easy! Here are a few other photos of the finished project. And a close up of the coloring of the girl stamp which I did pop up using dimensional squares. The sentiment is also from the "Let Love Grow" stamp set and was die cut using the "Scalloped Rectangle Die Set"
Thank you for stopping by today. I hope I have inspired you to think outside the box. When you have a design idea just GO FOR IT! Today I have a colorful card to share using a (New to me) technique. Using Sparkle N Sprinkle products I decided to show off different dies. I was going for a Batik look and I just love how this turned out. For this card I used Versa Mark along with our Mulberry Opaque Embossing Powder EP415 to jazz up the sentiment die. I simply stamped the die cut with Versa Mark ink and heat embossed it with the Mulberry Embossing Powder. Make sure to use tweezers so you do not burn yourself when heat embossing. I did 3-4 layers of embossing powder to create more dimension. I hope I have helped inspire you today. Have a fun and creative day! 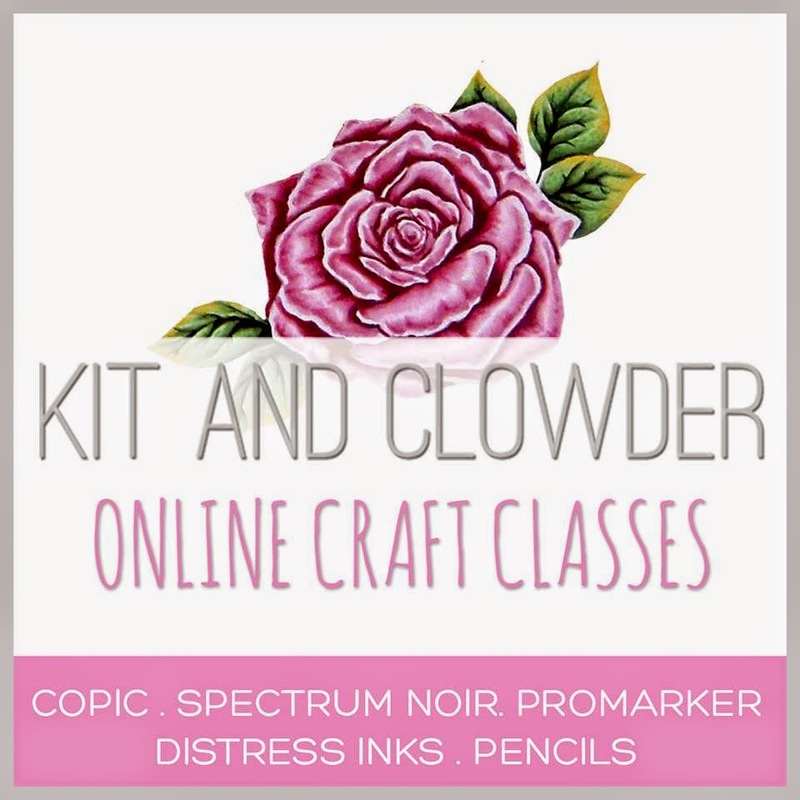 I hope this post is finding you in a crafty mood. This is my newest project featuring the beautiful "Love in Bloom" Stamp Set by LDRS Creative. 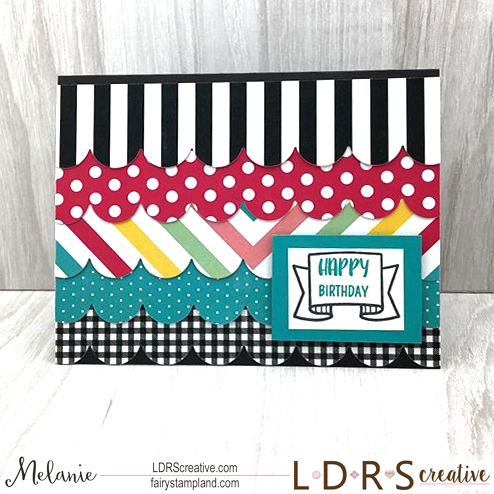 This is a multi layer stamp sets which is SO MUCH fun to play with. Just look here at all my fun flowers all stamped out using our LDRS Creative Hybrid Inks. It was a joy stamping these flowers and they are very user friendly. Along with the Love in Bloom Stamp Set I have also used the Eyelet Lace Rectangle Die Set and our Hybrid inks in Pink Tutu, Lipstick Jungle, Kiss Me Red, Four Leaf, Evergreen, and Raven. You can see all of our Hybrid Inks HERE. Below is a close up of the flowers. I have used some clear glitter glue to add a little shimmer. Thank you for crafting with me today. I hope I have inspired you to get out your stamps and inks and play today! Have a wonderful week my friends! Who is ready for SPRING already?? I know I sure am. With Spring comes flowers and growth. This new stamp set I am using today is called "May Showers" by Sparkle n Sprinkle. It is such a fun set to color. 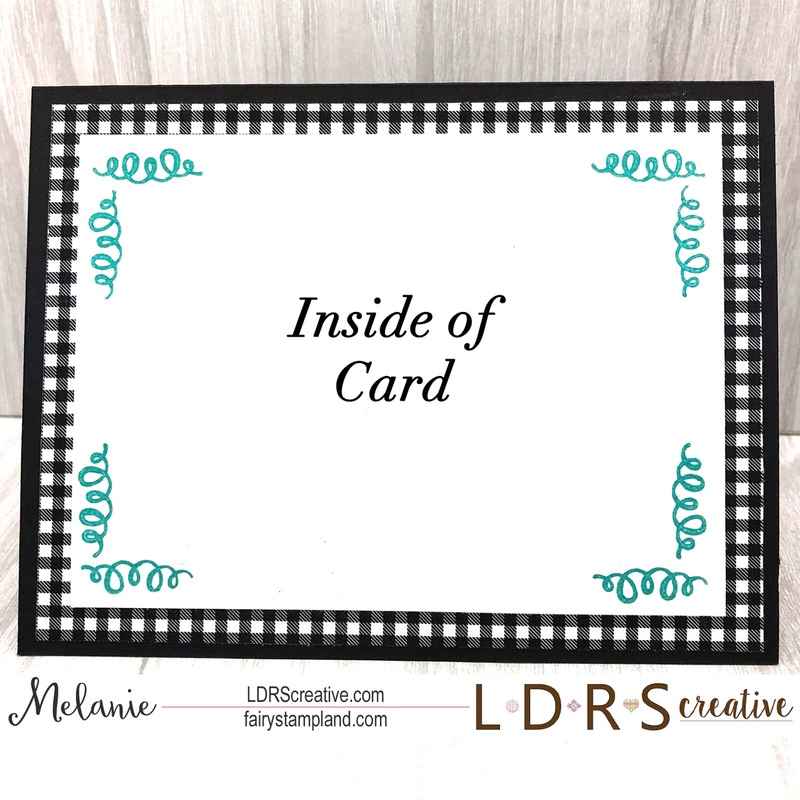 To create this card I started with a 6" card base. 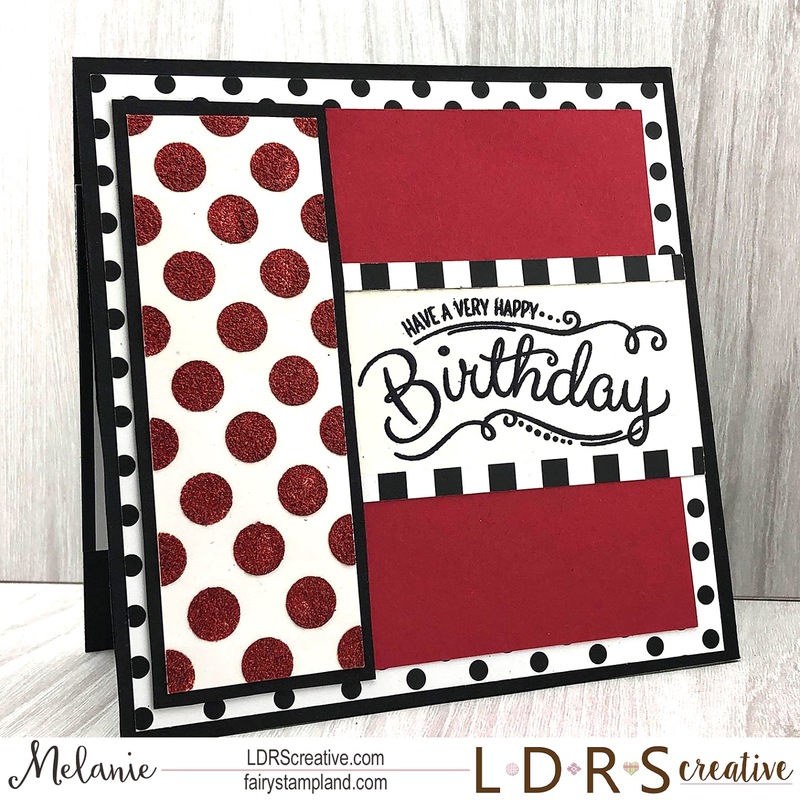 Using the Tonic Studio's Diamond Corner Dot & Drop Die for extra interest to the card base. I colored the beautiful "April Showers Promise stamp set choosing Yellow for the rain boots. Yellow is a tricky Copic color to work with so I did a step by step showing you each step with one rain boot so you can see how to get the shiny highlight in the boot. Step 2: Using Y13 add color to the shadow area. Step 4: Now with Y15 you will now begin "dragging the darker color towards the highlighted center. Step 5: Using Y13 you will now again focus on dragging the last color towards the highlight in the center. Each time you do this you are blending the colors. Looking at this photo above you can see where the lighter marker in each step has de saturated the over all color, and the boot looks kind of blotchy. To correct this you just add an extra layer of colors. Step 6: Using Y15 you will again add darker color to your shadow areas. Step 7: Using your darkest marker add a little more depth where you are wanting your shadows. Step 8: Stepping back down now go to your Y15 and again "drag" the darker towards the highlighted center. Step 9: Lastly do a light blend using your lightest color (Y13) This will seamlessly blend your colors. Here is a close up picture of the final coloring. I hope you have enjoyed this little coloring tutorial as much as I have enjoyed creating it. Have an amazing day! 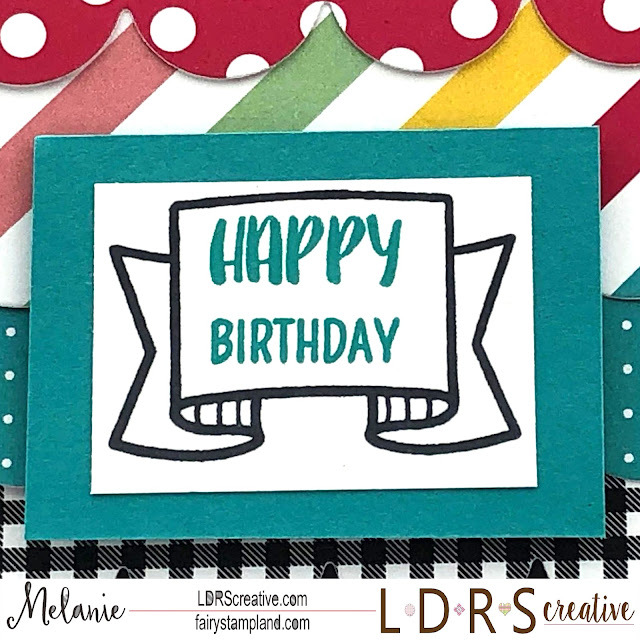 I have a nice bright and cheerful card created for Sparkle N Sprinkle. They carry a large collection of Fairy stamps and dies. If you are a fairy fan like I am you will love the Tonic Studio's Fairy Stamp & Die Sets. Have you seen all the different Fairies we carry??? They are simply beautiful. Copic markers were used for the coloring of this striking fairy. I then added Nuvo Droplets all around the outside of the stamped image. Since I did this I decided to not use the outline die at first. But then once colored I wanted to add some black shadows to the fairy so I decided to cut 2 black outline dies and I used them behind the stamped/colored image. It is so striking....hard to tell all the detail from these photos. in this photo you can see the translucent Nuvo droplets that I added to the lime green halo around the stamped image. For the sentiment I have used the Venus Violet Opaque Embossing Powder EP379.